I wanted to replace the brass pulls on my 25-yr. old bedroom set and the size (4.5" on centers) was truly difficult to find. These handles are perfect and also were less than *** each so they were a great deal also! Update your kitchen cabinets or bathroom vanities with these beautiful shell styled solid die-cast zinc alloy satin nickel cabinet drawer pulls. 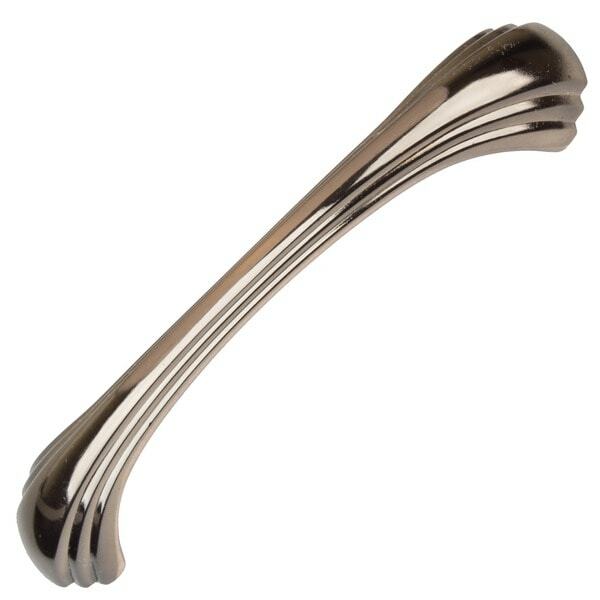 These pulls are finished in elegant satin nickel for a long lasting lovely accent to your decor. Everything is great about this product as far till now. Its been a week I installed this on my cabinets. Sturdy enough with right screws (longer screws not included for mounting on horizontal drawers). For the price point of view, these are a steal.. I have to cut down one star for following reasons. 1) screws provided were not long enough for some drawers. 2) The finish is not exactly satin nickel. more like chrome. But I have a mix of chrome and satin Nickel finishes in my kitchen. So I can live with that. Impossible to find but found it here! Standard pulls are 4 or 5 inches. 4.5 inch center to center was impossible to find and took me over a year. I was so happy to have found there here on overstock. The price was fabulous, the product I received was perfect. The product came when it was supposed to and I couldn't be happier with my new cabinet pulls! I was pleasantly surprised when I received these drawer pulls. They are well made, solid and smooth on the rear surface where your fingers will be grabbing them. At ANY price you can't go wrong with these. 4 1/2" drawer pulls are hard to find and I was excited to find that what Overstock had in stock, turned out to be an excellent choice. We bought 50 of these for our kitchen and they look amazing 3 years later. They were easy to install and the satin nickle hides fingerprints and smudges well. I love them. 4.5 center cabinet drawer pulls. OVerall, I'm very pleaed. I had looked everywhere (I'm in the St Louis area) for 4.5" center drawer pulls as I did not want to re-do the holes in my cabinets. The one or two that I found were definitely not an option. Finally when I checked your website I actually found them. "Are these available for 3 inch screw spacing? I needed a matching set of both 4.5 and 3 inch pulls." I was unable to find 3 inch pulls that match this set. "Are screws included? What size?"